Mississippi ranks third in the country for the number of adults without teeth. MPB's Jasmine Ellis reports on a program that's helping young kids take care of their teeth early. Poor oral health can lead to many health related problems such as diabetes and obesity says Dr. David Felton, dean of the University of Mississippi Medical Center's School of Dentistry. He says one of the leading dental health issues in Mississippi is adults needing to replace their teeth. Maziah Williams is a third grade student at Johnson Elementary School in Jackson. She's getting her teeth cleaned by third year dental student Jared Akers. 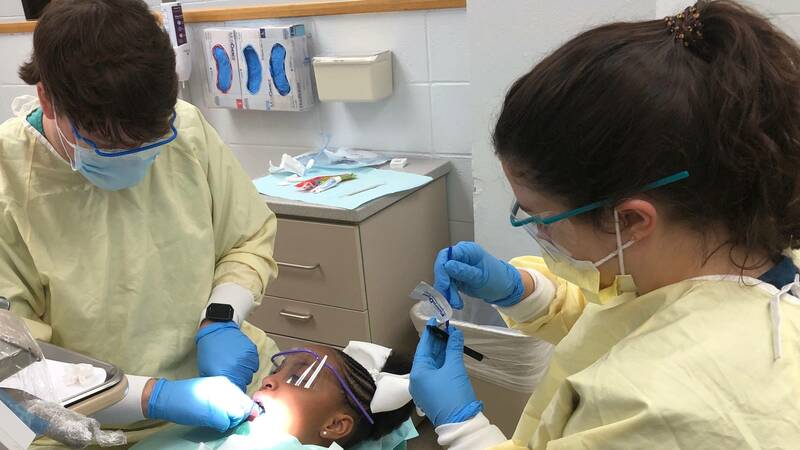 It's Give Kids a Smile Day and volunteers at the UMMC's School of Dentistry are providing care to several hundred elementary-aged students from Jackson Public Schools. Akers says it's important to teach children good oral hygiene early to prevent serious infection. “It allows us to bring the kids in,” said Akers. “And we can say, ‘We need to start developing these habits now so that we can protect your teeth for the future’ for when they become adults. And hopefully they can keep their teeth longer, stay healthier longer, and promote better health. Mississippi ranks 46th in the nation in overall oral health according to the website, "Toothbrush."